MY FATHER’S HOUSE is always buzzing with activities! We keep our boys very busy. Everyone is expected to do their very best in school. We monitor their grades closely and provide tutoring where necessary. Presently we have 38 highschool students and 20 college students. We have two group homes and several neighbouring apartments and rooms. Without a doubt these young people will help to build this nation! Richard, Emmanuel and Dominic in Gr. 12 High school students taking a break after school. 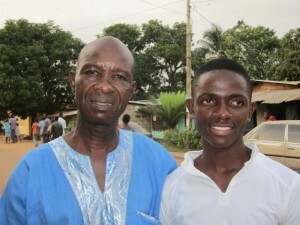 Jeremiah Gaye (white shirt) stands with his teacher who honors him for his outstanding grades. 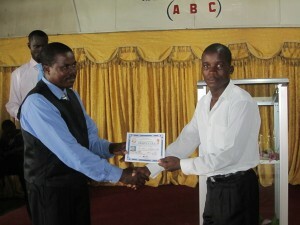 Joseph Sackie ( yellow shirt) gets awarded for Home Medical Care. He assists our boys to the medical clinics. Joseph is in Gr. 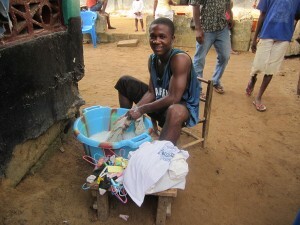 12 and his dream is to be a pharmacist. To-day, with funding, this is a possible dream! You are making NATION BUILDERS by your support and communication with these young men! If anyone would like to sponsor one of these CHAMPIONS we would be most delighted. 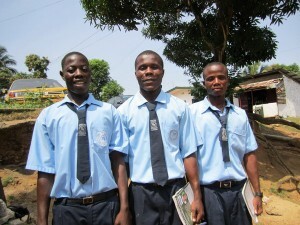 We have several students who have no sponsors for school this September. 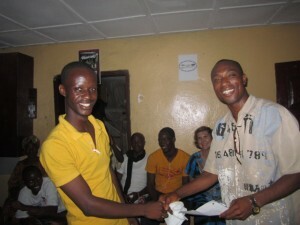 300 Dollars will sponsor a Highschool student for the entire year, this includes all materials. 200 Dollars will sponsor a Grade School student for the entire year, this includes all materials.